Pet-serve was established in 2005 by David Ferris. David is a former USPCA Welfare Officer and is completely dedicated to looking after your Pets. 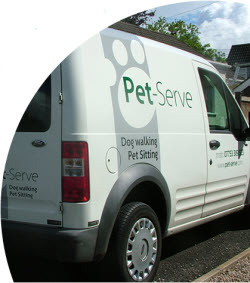 Pet-serve is situated in Drumbeg, 10 minutes from Belfast and Lisburn and we have regular customers in Lisburn, Dunmurry, Carryduff, Newtownbreda, Finaghy, Belvoir, Malone, Cregagh and Lambeg. Pet-serve is P.S.N.l. checked (references available) so you can rest assured at all times. **** Dog Walking - For fit and healthy dogs ** Regular exercise for your pet at your convenience. ** Pet Taxi - Transport in comfort ** Transport to and from, well, anywhere! ** Pet Sitting - There's no place like home ** A much better alterative to a kennel is a familiar environment, like the pets own home. Pet checks are carried out while you're at work or on holiday and safe home security checks are also carried out for peace of mind. Also cats can be fed at home and clean litter trays left! 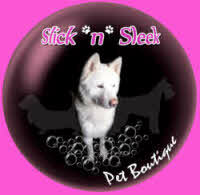 Slick n Sleek Pet Boutique is a professional friendly grooming service based in the heart of Lisburn city and serving all surrounding areas. We have an individual tailored service meaning that we can work with all breeds, sizes and temperaments. Our custom unit is kitted out with the very best equipment and products meaning that your pup will receive the very best treatment. We offer a £5 discount off your first session followed by our loyalty card and a multi-dog discount for owners with more than 1 dog. We have a 100% hands on policy meaning that our hands never leave your pooch while they are in our care, unless of course they are taking an after groom nap in our custom restroom with subdued lighting and relaxing music, making your pet as comfortable as possible.